Some times it all gets too much, juggling umpteen balls and feeling like you are dropping a lot of them. It's all too easy to get caught up with some things (like blogging for example) and forget to see what else is going on.We put ourselves under pressure and it can lead us to question why we are doing any of it - we can even lose our 'mojo' altogether and just stop doing the things we started out loving! That's good - you need to step back to reflect and prioritise sometimes. I can only speak from my experience and say be kind to yourselves; if you need 'time out' then take it. The only thing that disappears for good is precious time spent with our families and growing children/grandchildren. Everything else will still be there in some form or another as and when we return. And when you do feel lost try looking for something which inspires/excites you. For me it's all about Italy/Venice at the moment. Other themes are having to be covered (like Father's Day) but thoughts of the Mediterranean are never far away. I had a real play session with glass bead gel medium to see what was possible and then went mad with gesso, stain/paint resist, and ink misting, so now there are piles of CS waiting for their moment in the spotlight. So here's me, post-play, left with a gorgeous coloured and textured panel with added gilding wax highlights wondering what to do next. Thoughts of enigmatic faces like Mona Lisa came to mind so I dug out this beautiful face from the ever-expanding stamp collection and to my delight found it fit beautifully. Stamping directly on top was not an option but the wonderful Laura pointed out that you can stamp onto the white 'under-layers' of tissue napkins and apply them with watered down PVA. It worked a treat. The rest sort of fell together as if it was meant to be. During a Creative Expressions blog hop the idea of using ribbon as a background was suggested and as I won some beautiful crushed ribbon as part of a prize in said hop it seemed rude not to use it. This works really well if you want interest that doesn't detract from the focal point. Finally the latest Simon Says Stamp and Show challenge asks for buttons - well I've got one or two (hundred!) and these special Mother of Pearl ones, layered on some simple die cut/punched elements, seemed to fit the bill rather nicely as I'd been at a loss for what to use for the finishing touches. There is a sentiment - I had a special destination in mind when creating it and I hope the recipient will be as thrilled to receive it as I was to make it. And that's the point of all of this. Make things you love for the people you love and those you care about and it all makes sense. 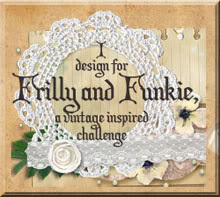 Over at Frilly and Funkie, Sue has a superb step by step for her recent DT tag, and Terry shows you the magic she spins with Wendy Vecchi products. These are now being stocked by The Funkie Junkie Boutique and have been heavily discounted for the launch this coming week. And today sees the unveiling of four superb projects by members the Our Creative Corner DT as part of the 'Recipe' challenge - these are also a must see. For now I hope you all have a weekend that lifts your spirits and recharges your batteries. And remember, don't sweat the small stuff! So much to look at - and all of it beautiful. Some good words of wisdom and a beautiful piece of work with the bead gel - look forward to seeing some of the other experimental pieces in due course. Thanks too for the link about blogs etc, much appreciated. Fantastic make Jenny. I love all the details and the embellishments you have used. Beautiful keepsake card. This is so lovely Jenny. While I have not used the gel you describe I have just thrown beads into ordinary gel medium and been delighted with the look! How funny that we are both playing with tissue paper stamping - separated by a very large ocean but kindred artists in spirit! 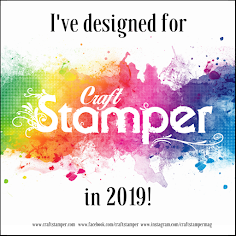 It's a funny thing because my favourite magazine is Craft Stamper which arrives weeks after release in England and Ialways have a laugh as so many techniques are being played with over here - I feel like I must be privy to publishing planning. Ha ha! The end of the saying is - don't sweat the petty stuff and don't touch the sweaty stuff! Hope you have a wonderful weekend - we had the most glorious day here and at lunch time the ladies in my class all perched on the steps in the sun. It was fun! I'm back to say I adore your pearl buttons! I have a small stash and avidly add to them whenever I spy them! Great card, I love the autumnal colour scheme and the rich textures! Thanks for joining us for this week's Simon Says Stamp and Show Challenge! Beautiful panel - you look like you had a great time creating this!! an absolutely gorgeous make, in true jenny style! love this and look forward to more of those glass beads make soon..
Jenny I have to say that I adore glass bead gel medium (I use Golden) and it is something I always reach for when working to a theme of Venice as it brings such richness to the piece. So I was excited to see you using it. Love your colours - divine. Hi Jenny - great words of wisdom and all so very true! You have cheered me up no end and I don't feel so bad about losing my mojo at the moment. You should submit this to SSS&S for buttons as well! Gorgeous gorgeous! The texture is exceptional! I love her face Jenny...just a wow! Thanks for buttoning up with us this week here at Simon Says Stamp & Show!!! Love love love this! The texture is amazing on her face...just striking Jenny! Great Jenny, that almost hidden face ...so artistic! Lovely creation in total. I was hoping we'd get to see some of Buttons's buttons this week... and what a beautiful creation it is! The effect you've achieved with the golden glass bead medium is amazing. Would love to see a video (!?) as I've no idea what it is really... and the face emerging is so haunting. Beautiful work! Hi Jenny, WOWser, I love this project, the textures and colours are divine, and the 'face' is a stunning addition. I would have loved to watch you do this project !! Brilliant 'words of wisdom'. Have a lovely weekend. I can so identify with your post Jenny so thank-you for nailing it! Great post Jenny, you're right it is very easy to lose track of the really important things in life and then live to regret it. "Words of Wisdom" thank you for pointing out something that should be very obvious to all us crafter`s. You are so right our families are so much more important, we sometime loose that when we get "lost" in this crafting jungle. Love what you have done with your wonderful project and the fantastic use of those glorious buttons. Looks like you have had loads of fun doing this one. This is such a stunning work of art! I love the glass bead gel and the soft neutral color palette! We do push sometimes and then almost draw a blank, so I hear you! Hope you had a wonderful weekend! Great layered card...loving the beads too. Love the depth of the colour andthe overall feeling of this card. Just wanted to say that I am home from the lake and was finally able to check the amilbox. Waht wonderful surprises awaited me. Your ATC is gorgeous. That verdigris etal feel to it is fabulous.Love the embossing and the glimmer and shimmer. Finally the words are all so true! I need to remember that more often! Such true words spoken Jenny. Your creation is awesome. So love the textures and colours. 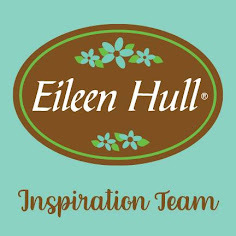 Thanks for becoming Follower at my little blog and taking part in my give away. Your words were exactly what I needed to hear and confirm for myself. You're right, we all go through it and it's so refreshing to know that others do to and see the creative mojo that returns and inspires. Your card is gorgeous. Almost an optical illusion at first as I didn't see the gorgeous face, but WOW, is that ever stunning. Such an inspirational piece Jenny, your really are the queen of texture. I love it.